Weekly Upgrade: What?!?! 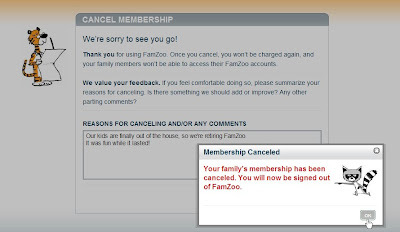 You Want to Cancel? by Bill Dwight on Wednesday, January 13, 2010 at 4:03 PM | LEAVE A COMMENT! This week, we polished off more of the nitty gritty details of subscription support. Details like sending an email receipt for a subscription purchase. We also made a first pass at the pages for updating your billing info (e.g., switching between a credit card and PayPal as your payment method, changing credit cards, updating a credit card expiration date, etc.). Fun stuff...not! And now...the countdown is on: one more week and we're opening up the doors! P.S. We also replaced our old "Community" link in the top navigation bar with links to our Facebook and Twitter pages. Please join in and help us spread the word!